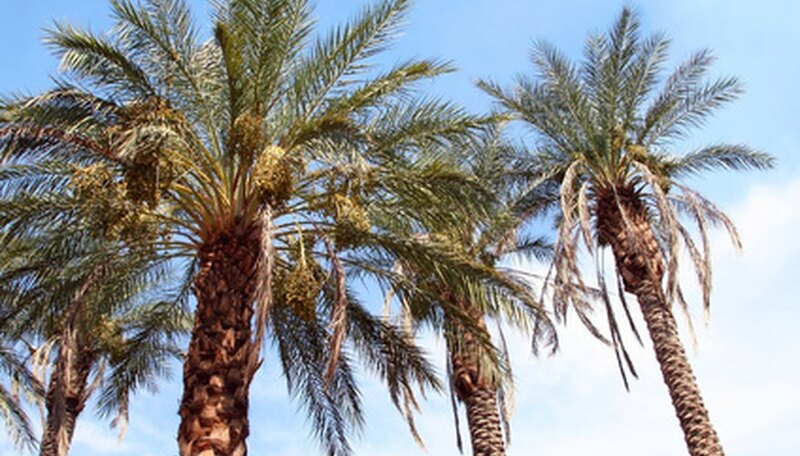 Like any other plant in the garden, palm species are subject to a host of specialized pests. The gardener who can identify common palm bugs will be able to assess the situation and treat complications early, increasing the odds of saving the palm from a serious infestation that may lower its ornamental value or even cause its death. The cabbage palm caterpillar (Litoprosopus futilis) is a brown and black caterpillar of about an inch and a half that can be found chewing on palms throughout Florida, as well as in coastal South Carolina and Texas. The insect is a common pest on cabbage palms (Sabal palmetto), where the larvae can be found burrowed deep within developing flower spikes or new buds. The cabbage palm caterpillar may also infest houses, ruining fabrics by trailing a dark brown stain and chewing through furniture. Cabbage palm caterpillars are difficult to prevent and remove and often require an insecticide specific to their species. The royal palm bug (Xylastodoris luteolu) is a tiny, oval-shaped, whitish yellow bug less than 1/10 of an inch. The bug is a common pest on the Cuban royal palm (Roystonea regia), a species native to Florida and Cuba. Royal palm bugs eat new leaves, which causes unsightly yellow spots and eventually brown streaks. The damaged leaves then wilt and gray. Although royal palm bugs rarely cause the death of a tree, they greatly lessen the ornamental value of the palm and cause the plant's health to deteriorate. They may be treated with insecticide directly on the leaves or via a water-diluted root drench, which allows the tree to safely drink up the insecticide. The coconut mealybug (Nipaecoccus nipae) is a common palm bug that can be found on palms throughout the world, from the Americas to Australia, Europe, Africa and Asia. The tiny oval bug is a whitish orange color and is covered by waxy protrusions. The coconut mealybug may harm many different palm species, including the pygmy palm (Phoenix roebelenii), the parlor palm (Chamaedorea elegans) and the Queen palm (Syagrus romanzoffianum). Coconut mealybugs feed on the sap of palm trees, causing a black mold that attracts legions of ants. Palms infected by coconut mealybugs may have yellowing fronds, or moldy, whitish or black patches on their foliage. Mild infestations can be treated with pruning, or simply a quick rinse with soapy water. More serious infestations should be treated with repeated coverage with insecticidal soap.